Before purchasing that defensive handgun - consider FIT. Do you have a firearm which you use for personal protection inside your home or for daily carry? During my Concealed Weapons Training Course, some students have made an unintended discovery - they had purchased an expensive firearm that didn’t fit them. Of course it is better to discover such during training than during a real life defensive encounter. Within the first few hours of my Concealed Weapon live fire training course, we focus on numerous matters, including: the rules of firearm safety, marksmanship fundamentals, grip, firing platform, shooting positions, drawing from the holster, scan and assess, reloading, and moving off the line of attack. It is during this active training, that students may begin to realize that the gun they purchased for self defense doesn’t fit them. It’s similar to setting out on a 50 mile hike with a brand new pair of boots which you hadn’t worn before. This article sets forth some of the preliminary matters you should consider before you make the investment in that firearm which you intend to use for self defense. There are other factors also, and you should seek out professional assistance. Caliber selection, stopping power and recoil will be covered in the future. Merely going to the gun store and selecting a firearm because it is the one a friend told you to get, or one that looks nice, or "this one is small and compact", doesn’t necessarily translate into a good decision. Why? Because if you are attacked and have mere seconds to effectively and decisively stop the threat, such is not the time to discover that you can’t physically operate your firearm! While not intended to be exhaustive, the following are among the preliminary factors you should consider when purchasing a firearm. These actually include examples of things that some students have "discovered" while taking my CCW course. Thus, you may wish to consider them (and others) before you part with your hard earned money. Does the gun point naturally in your hand (both in one handed and two handed shooting positions)? Is the grip too large or too small for your hands? Sometimes, changing the firearm grips can help a gun fit better. Can you see the sights on the gun? Are the sights big enough? For some people, a semi-auto feels better and points more naturally in their hands. For others, a semi-auto may be too complicated or intimidating. On the other hand, a revolver may be more suitable for persons with arthritis or other physical circumstances. If the gun is a semi-auto, can you physically operate the slide? It may be that you don’t have enough upper body strength. If that is the case, then the gun isn’t for you. 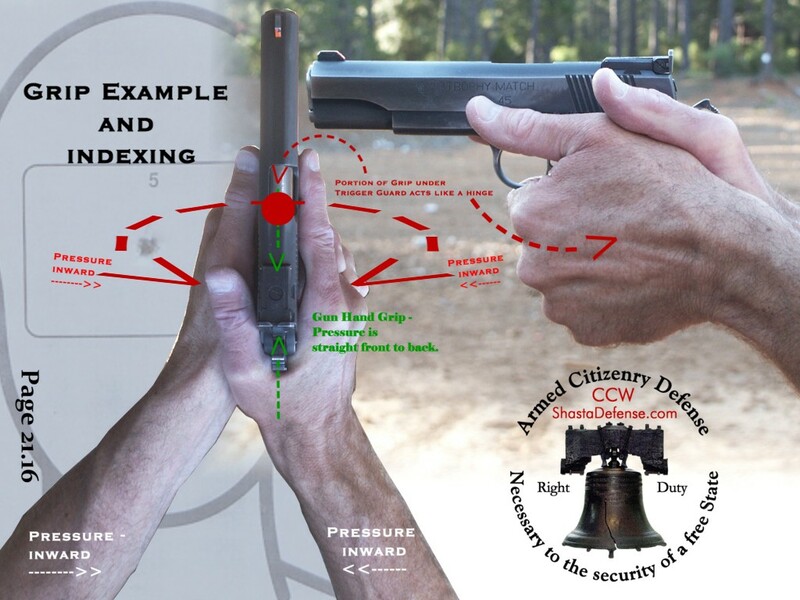 Can you reach the trigger and press it back smoothly while maintaining a proper firing grip? You don’t want to be in the position of having to rotate from a proper grip because your trigger finger (left or right hand) isn’t long enough to "press" the trigger. On a related note, if the trigger has a safety in its middle, is your trigger finger long enough to reach and depress the safety device? If the firearm has a decock lever, can you operate the decock lever without having to use both hands (i.e., one handed operation at least with your strong side hand)? If the firearm has a thumb safety, can you operate the thumb safety (on and off), without having to use both hands (i.e., one handed operation at least with your strong side hand)? Is the safety large enough for you to operate? Can you reach and operate the slide stop at least with your strong side hand? Can you reach and depress the magazine release button using only one hand? Try this last operation with the gun first in your left hand, and then in your right hand. If the firearm is a revolver, can you reach and depress the cylinder release latch with only one hand. Again, try this operation with the gun first in your left hand, and then in your right hand. Do you have any physical limitations or conditions in either hand which would result in your not being able to use this particular firearm in an active defensive shooting role? When you extend the gun out with a two handed grip, is the gun too heavy? When you extend the gun out with a one handed grip, is the gun too heavy? Try holding the gun one handed with your right arm extended and next with your left arm extended? Can you support the gun in such positions? Considerations should also take into account the caliber and recoil related to the weight of the gun. Some of these operations may take some training, but you want to at least know that you can physically operate your gun. Again, always follow the firearm safety rules. You will notice that several of the above questions bring into focus that in a life threatening encounter you may have to operate your defensive firearm with only one hand. This is because your other hand may be blocking or striking a threat, protecting a family member, or is injured. Thus, you can see that merely going to the gun store and holding a gun in your hand and thinking - "this feels pretty good", is not good enough.